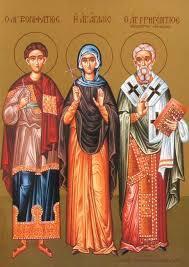 Saints Boniface and Aglaia lived in the third century and both were Christians. Saint Aglaia belonged to the class of noble and wealthy Roman women. She had a merciful heart and for this reason she was always inclined to charity and good works. Saint Boniface was secretary, property manager and supervisor of the building projects of Saint Aglaia. Like his mistress, he also loved God and was philanthropic. But, as Saint Paul says: “Let him who thinks he stands take heed lest he fall” (1 Cor. 10:12). This means that the person who is struggling to walk the path of God’s commandments must constantly be vigilant and careful not to go astray, because the devil, the enemy of human salvation, constantly strives day and night to lure even the “elect”. Unfortunately, Boniface and Aglaia did not avoid falling into sin. Despite their good intention to live according to Christ, unfortunately they were not particularly careful, and so their numerous material goods altered them and pushed them towards indulgence and sensual pleasure, which resulted in them doing something unthinkable. However, they did not remain in a fallen state, but they immediately repented, wept bitterly, confessed their sins, and followed the path of the Lord with greater zeal. Boniface was made worthy to give his confession for Christ and to seal it with the blood of his martyrdom. Aglaia distributed all her belongings to the poor and with divine zeal devoted herself to asceticism and prayer. The end of their lives were venerable, unashamed and peaceful. There is no sin that cannot be forgiven by God, when a person repents sincerely and changes their lifestyle. The only sin that cannot be forgiven is blasphemy against the Holy Spirit, which means to not repent, and this is due to pride. A proud person cannot repent of their sins, and even ascribes the works of God to the devil, like the Pharisees who were contemporaries of Christ, who would say of Christ: “He casts out demons by the ruler of demons” (Matt. 9:34). The humble person, after they fall, does not despair, and does not rush to commit suicide like Judas, but like the Apostle Peter they pour out bitter tears of repentance and place the hope of their salvation in the love and mercy of God, from Whom they receive “speedy” remission. Unfortunately, in our time there are not many who sincerely repent, as well as those who recognize their mistakes and humbly seek forgiveness. Most believe they are always right, while others don’t want to recognize it. Surely, no one is infallible or sinless. Human nature after the fall of the First-formed is prone to sin and it requires a hard struggle for someone to transform the powers of their soul and turn them towards God and the prospect of doing His commandments. When, however, repentance is absent from the life of a person, then distortion makes it appearance in all its splendor. Indeed, in some cases the distortion is so great that it makes communication between two people from difficult to impossible, because each one with various words and expressions gives different meaning and content or only wants to understand that which serves their passions and their individual interests. We are experiencing today, that is, a contemporary Babel, where there is a confusion of language and mindset. In other words, one can observe today the phenomenon where someone expresses or supports a certain view and in reality means something totally different, and the one they are conversing with understands only that which they want to and they distort it in order to impose their own view. And then there could be a third person, perhaps, who interprets things in their own way, in a way they want things to be said, and so a vicious circle is created. The result is that someone often doesn’t even understand what they themselves are saying. The majority of people in our day do not appear to prefer dialogue, which is made by stating arguments and extracting from these some conclusion, but they like to consume slogans. Of course, no one objects to this, because maybe in some cases slogans are needed, but the problem is when slogans are invited into the dialogue to prove by arguments the correctness of their views and claims, then it turns out that most are unable to do so. In other words, they are not able to discuss things calmly and politely, and to calmly listen to the opposing view and refute it with logical arguments. Surely one could say that this is natural in a certain way, because it is not possible to truly understand one another if we are not willing to break the shell of individual interests and try to position ourselves in someone else’s shoes. That is, it is impossible to truly understand each other if we do not love each other; if we are not released from our individualism, if we do not dominate our passions, because authentic love is the “grandchild of dispassion” according to Saint Maximus the Confessor, and not a simple emotion. Trying to rectify society should begin with ourselves, in order to “purify the inside of the cup and dish” so that it can be “clean on the outside”. Watchfulness and prayer combined with repentance, namely the genuine evangelical life, when lived authentically creates inner peace and spiritual balance that proves beneficial in societies and social institutions. Source: Ekklesiastiki Paremvasi, “Ά­γι­οι Βο­νι­φά­τι­ος καί Α­γλα­ΐ­α”, November 2011. Translated by John Sanidopoulos.